The thyroid gland is an important part of the body's regulatory mechanisms; thyroid problems can affect everything from body temperature to appetite to the pulse. Thyroid disease can include high levels of thyroid hormones and low levels -- each causes different symptoms. Caffeine, a stimulant found in coffee, can affect the thyroid in a number of ways. The thyroid gland is a butterfly-shaped organ located in the middle of the lower part of the neck. The thyroid secretes hormones to perform its primary function, which is to control the body's metabolism. These hormones, T3 and T4, tell the cells of the body how much energy to use. When the thyroid is functioning properly, the hormones will be used and replaced at the proper rate to keep the body functioning at its optimum level. In addition to T3 and T4, the other major thyroid hormone is TSH, or thyroid stimulating hormone, which is secreted by the pituitary gland in the brain if the thyroid hormone levels fall too low. Thyroid disease can result if the any of the hormones are produced in too high or too low a quantity; low levels are called hypothyroidism, and high levels, hyperthyroidism. Caffeine is one of the best-known components of coffee, but coffee actually contains hundreds of other compounds, so it is important to recognize that although caffeine in its pure state may have one effect on the thyroid, coffee -- with or without caffeine -- may have different effects. According to "Coffee and Health," by Gerard Debry, in experiments on rats, very high doses of caffeine caused the thyroid gland to enlarge, but at doses of about 300 mg, caffeine in humans did not change levels of thyroid hormones. But Debry also noted that coffee -- he did not specifically indicate whether it was caffeinated -- might protect against thyroid cancer or disease. Debry's examples show how there can be a difference in the effects of caffeine alone and coffee. In a research project conducted in Italy and reported in the March 2008 issue of "Thyroid," S. Benvenga, the study leader, described the effects of coffee and espresso on the thyroid hormone T4, noting that coffee interferes with T4 absorption from the stomach. From Greece comes an older study, reported in the June-July 1989 issue of the journal "Acta Chirurgica Scandinavica." A. Linos wrote that in a comparison of three groups of patients, 70 patients with thyroid cancer, 55 with benign thyroid disease and 71 controls without disease, coffee consumption clearly decreased the risk of either benign thyroid disease or thyroid cancer. The researchers believed this might be due to the caffeine. In an article in the September 1984 issue of "Clinical Pharmacology and Therapeutics," E.R. Spindel noted that doses of caffeine added to decaffeinated coffee had no effect on TSH or other thyroid-related hormones in men or women. 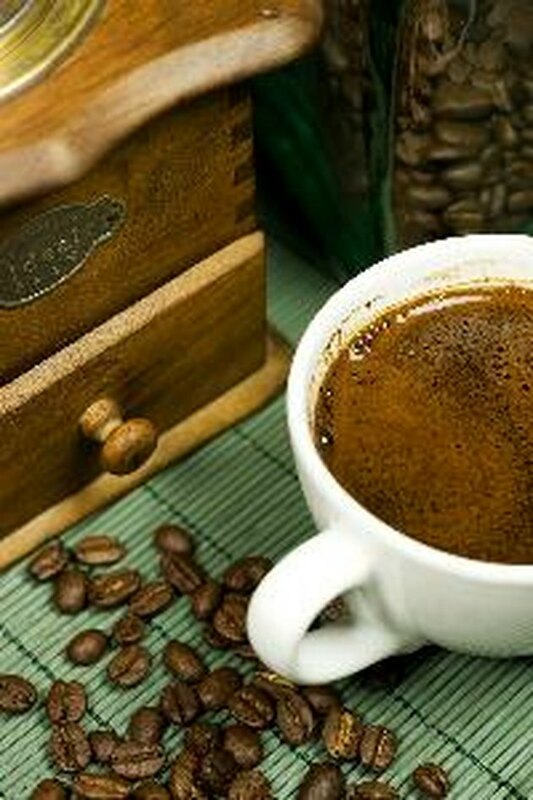 The impact of caffeine and coffee on the thyroid is mixed. Steven D. Ehrlich, writing for the University of Maryland Medical Center, recommends that people with hypothyroidism consult with a health care professional before increasing their caffeine intake, as it may interfere with medication or several disease conditions. If you think you may have any type of thyroid problem, consult your health care professional.